The light was perfect then Boom! The weather has been erratic the past month and the weather service has been less tan stellar in its predictions. One moment the light is perfect, you find some lovely early blooming wildflowers and then darkness begins to creep into your shots. Another minute passes and you realize it is time to get off the mountain. Black clouds begin to cover the once luminous morning sky. Then in the distance a rumble to let you know hiking should become more like a jog to get below the tree line and home. Autumn Wildflowers blooming on the trail edges are especially precious this year. The summer drought has meant Aster and Goldenrod have been a rare sight. A graceful transition of color and light touches each trail within our Forest in Hot Springs National Park. A tiny Prairie Lizard warms itself on a Rock below the changing autumn Leaves, further up North Mountain a Monarch Butterfly tastes the nectar of a purple Aster. A familiar family of deer crosses our path as we near the end of our journey. 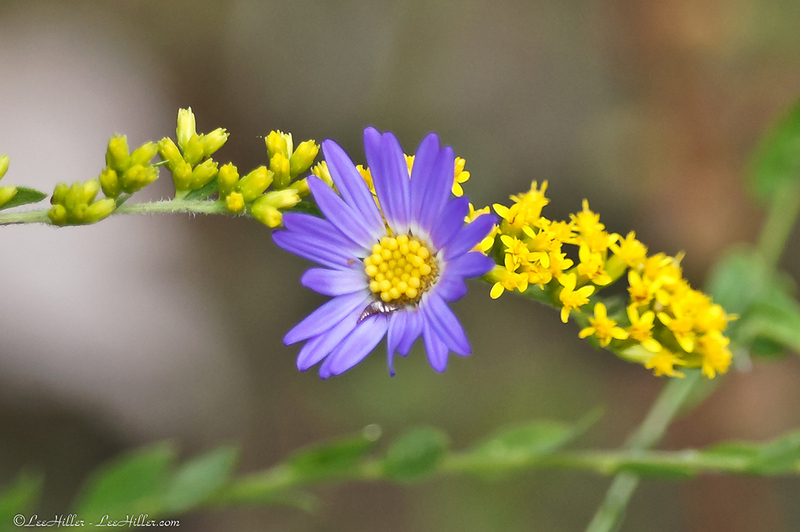 The trails in Hot Springs National Park are decorated in purple and gold with the arrival of late summer Wildflowers. Glorious Aster and Goldenrod reach up from a Forest floor covered in dried Leaves from years past. Humidity blankets the valley casting glimmering blue light across the Zig Zag and Ouachita Mountains. A Whitetail Doe takes care to shield her fawns from passing hikers. She kindly steps out from the brush when we are alone and allows me to capture her beauty. Her summer coat is shedding to make way for the new growth she will need for the upcoming colder weather. It is a joy to have seen her as a young adult, pregnant and now a Mother. At 9:30 am when I headed out to hike it was already 62 degrees heading toward a daytime high of 69. The week of Thanksgiving we had temperatures bordering on 80. The overnight temperatures the past 4 weeks have hovered been 58-62. It appears the Wildflowers are correct… It does feel like spring. This year spring temperatures arrived in late January and summer heat arrived in late April. Global warming has arrived in Hot Springs National Park and it is changing the Forest. Soon we will know which Trees survived the severe 2012 drought.